Three years ago I did my Sherlock Holmes art show, “Elementary: The Many Faces of Sherlock Holmes” at Theatre Memphis. 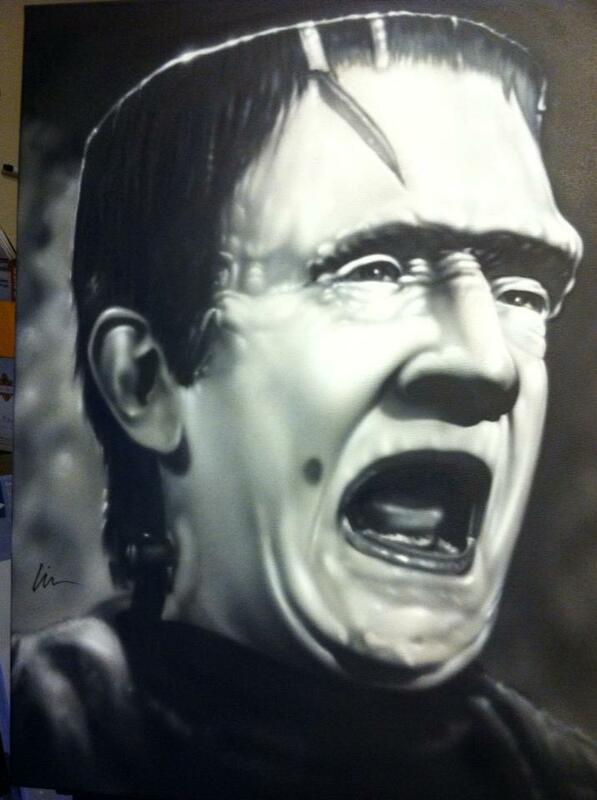 This October I’ll be returning to the lobby and bringing some of my airbrushed black and white monster portrait “Monsterpieces” with me for “Frankie Goes To Hollywood: Abnormal Monsterpieces”. 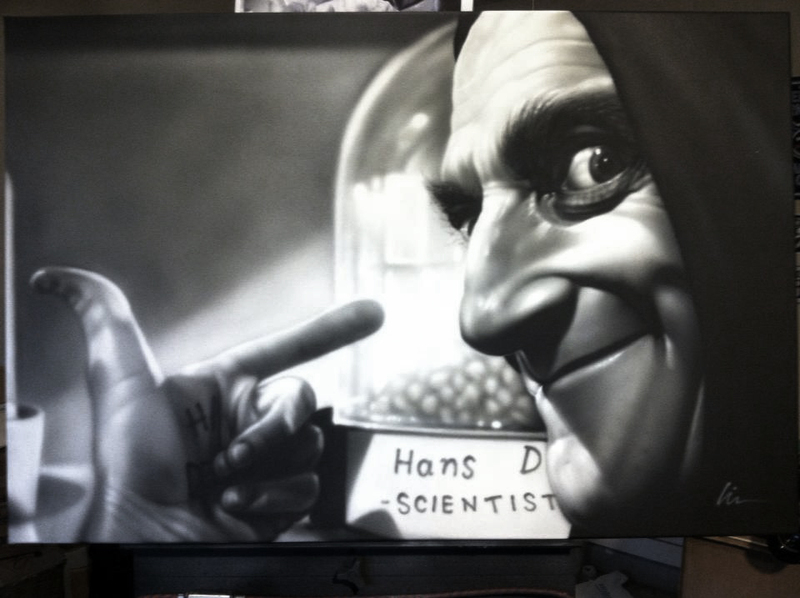 This art show will be in conjunction with Theatre Memphis‘ production of “Young Frankenstein“- October 11th – November 3rd. 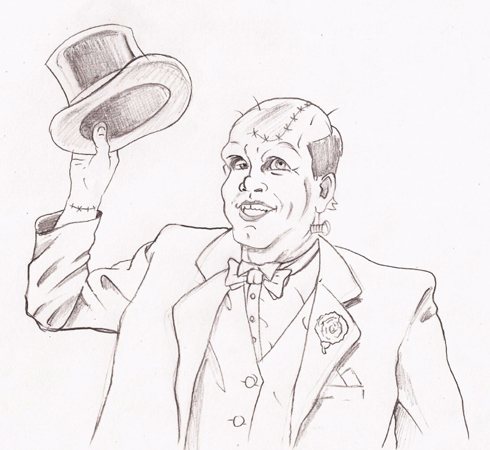 Much like the Sherlock show, this one will feature many faces of Frankenstein’s monster, or “Frankie“, plus some others inspired by Mary Shelley’s Frankenstein; or, The Modern Prometheus. 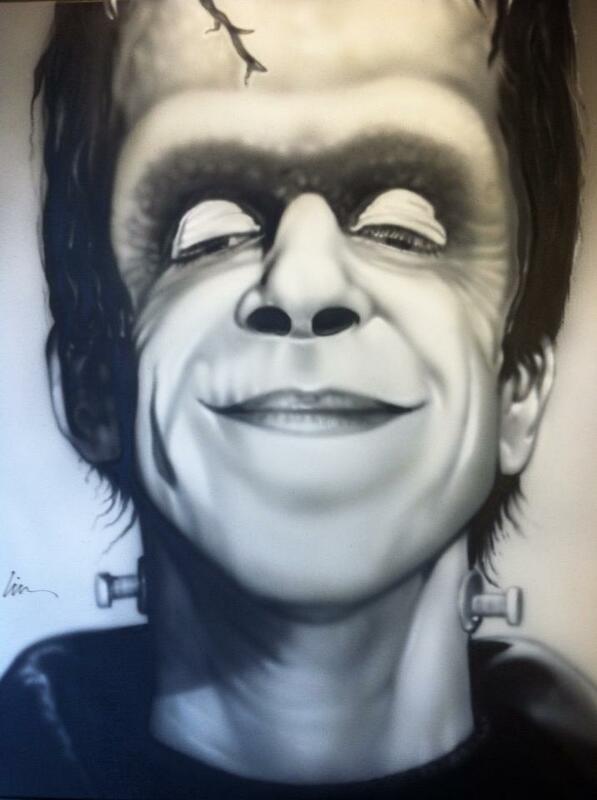 Like one of my favorite inspired versions of Frankie- Fred Gwynne as Herman Munster! Also did one of Bela Lugosi as Frankie, who like Boris Karloff and Lon Chaney, Jr. also played him and other famous monsters. And speaking of Boris, couldn’t do a Frankenstein show without him! 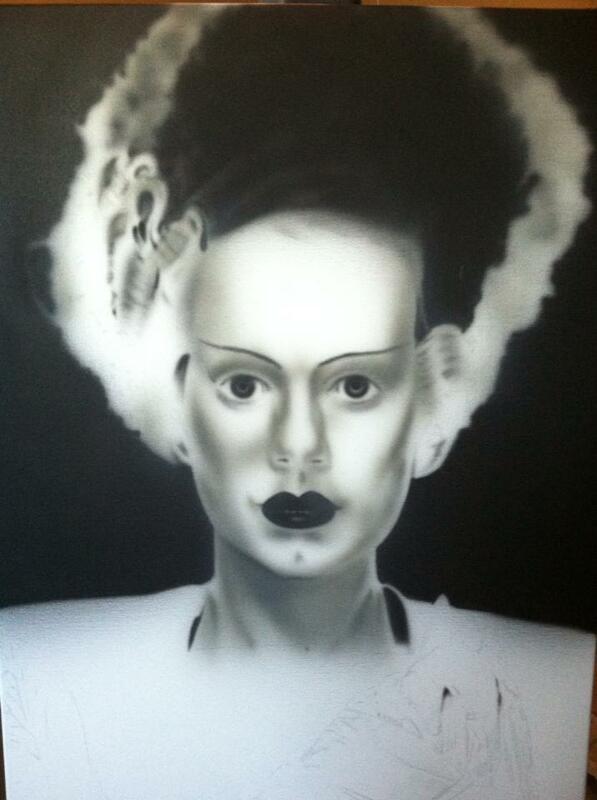 Working on a few more like Frank’s lovely “Bride”. 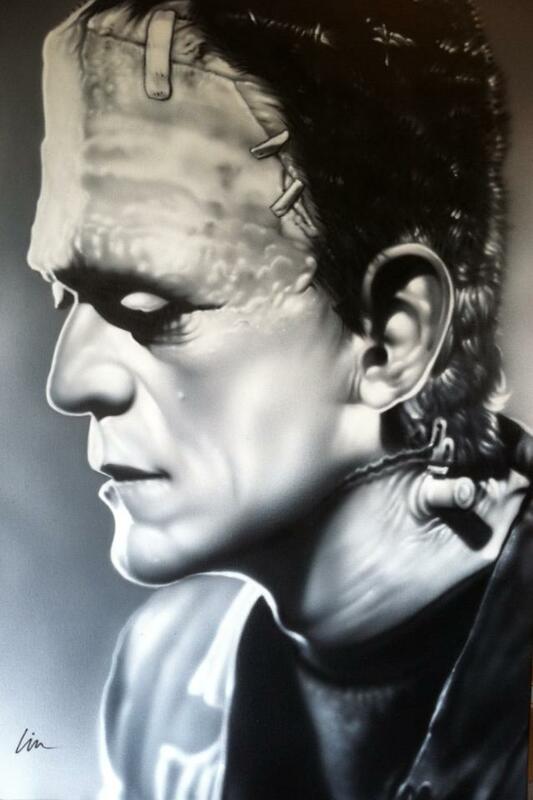 Each one is airbrushed acrylics on canvas and about 20″ x 30″ or 24″ x 36″. I also did the illustration for this production’s promo poster. Once I did the pencil sketch, I inked the art, scanned it, and colored it in Photoshop. 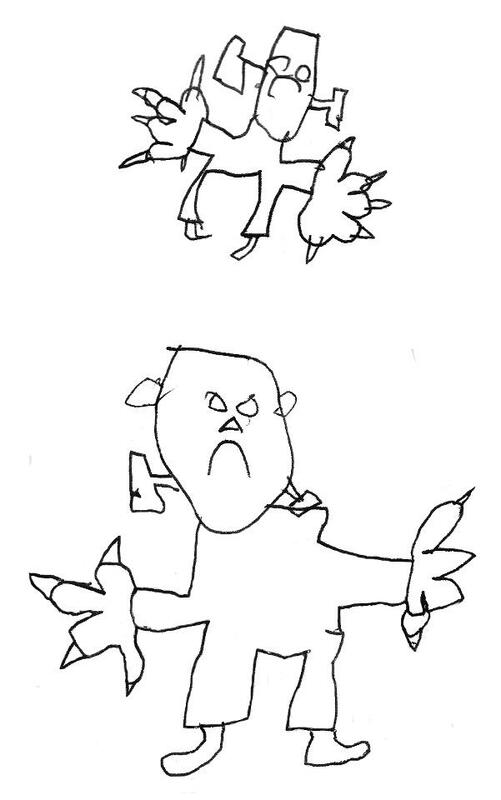 One of my earliest drawings were of Frankenstein, so I’m really excited about doing this art show. 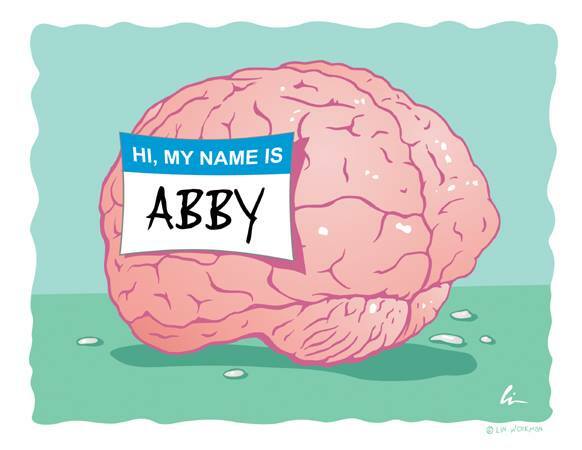 One of my “Scared Silly” paintings, “Abby Normal” will be going home with a lucky winner- details on that coming soon. 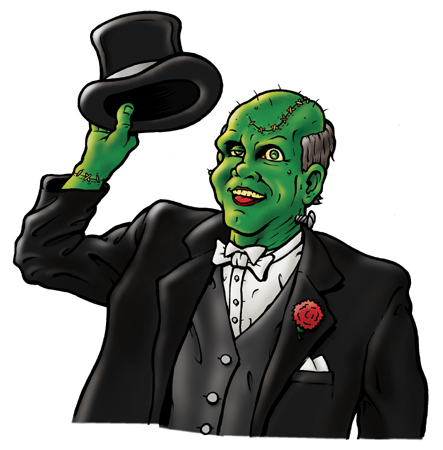 “Frankie Goes To Hollywood: Abnormal Monsterpieces” art show is free and open to the public in the lobby of Theatre Memphis during business hours from October 11 – November 3. My reception will be 7:00-8:30pm on October 15th. 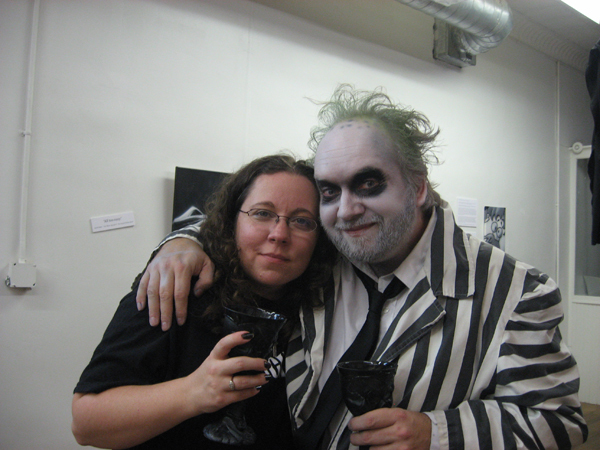 Everybody is welcome- especially those who show up in costume! ← “Hey, where the super women at?” Cryptozoic’s DC Women Of Legend Trading Cards Available 9/13/13 & New Sketchcards By Me! Igor pointing to the brain made me smile. It is one of my favorite cinema momemts. I’d like to purchase. Please let me know if it is available.